Shabbat shalom, welcome everyone, family and friends. Thank you all for coming to my Bar Mitzvah this morning and sharing this very important day in my life with me and my family. I really appreciate you being here. Especially, I want to thank my Grandma, Rebbetzin Tova Weisblum for making a special trip from Israel. I understand that Zeidy, my grandfather in Haifa, has his rabbi’s responsibilities in his large synagogue, and he sent my grandma as the family emissary. Grandma, having you here means so much to me. My other grandma, my mother’s mother Heitan, also could not be here today because she is taking care of my great grandma Rebbetzin Aliza Herzberg. I pray and hope that great grandma will have a refua sheilama. I wish my oldest brother Elimelech and my new sister in law Ayala were here, as well as all my aunt’s, uncles, and cousins. I want to thank Bracha, a wonderful sister and teacher. You are often strict with me but I love you and have to admit that I always learn something new from you. My sister Ayala, you are also very important to me. I know how much you care for me. Natan, my youngest brother, I love you. It is nice having a younger brother as a Torah partner. You are my little torah buddy. You are also a really good athlete, especially in hockey. It is fun to go swimming and having lap races together. Plus sharing a bedroom with you has developed my cooperative living skills. I feel privileged to be your older brother. Just like Elimelech, Bracha, and Ayala set an example for me, I hope I do the same for you. Dad and Mom, a simple thank you is not enough. I love you both and think you are great parents. I really look up for both of you. Dad, even with your busy schedule, you always find time for me. Even though I may want to be an architect, you remain my role model. Mom, you are the greatest. Mom and dad treat each of us as their ONLY child. Mom, I really enjoyed my first summer in sleep away camp at the Pocono Mountains in Pennsylvania. I had a great time, made a lot of friends, learned a lot of Torah and played even more. But I really missed you and your delicious cooking. And I decided that I would rather be woken up by you any morning than to the sound of a blaring camp trumpet or someone screaming "25 minutes to morning services." My family lineage includes many generations of Rabbis with my father being of the 14th generation. This means that I carry in my heart a serious responsibility and commitment to the Jewish people. I have traveled back and forth to Israel so many times and have a deep appreciation of both my American citizenship and Israeli heritage. Still Annapolis is my home. I want to thank my bobby in America, Rebbetzin Rosenblatt. You are such a positive and a great role model for me. To all my guests, many of you have known me for almost half of my life. I’ve been at Congregation Kneseth Israel for seven of my thirteen years of my life. So I have really grown up here. You have lived through much of my childhood and you have always encouraged me, for example: singing for you during Shabbat Services, which I enjoy very much. I would like to express my gratitude to the Kneseth Israel extended family, for all the love you have shown me over the past seven years. 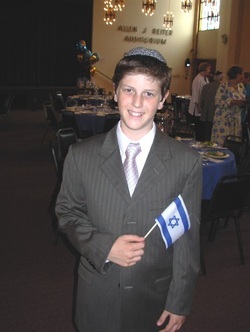 Additionally, I want to thank all the people in this wonderful community, who have worked so hard to make my Bar Mitzvah day such a special one. Particularly, thank you, Mrs. Roz Krimins, Mrs. Lynn Reiter Key and Mr. David Cohen. Under your leadership, with your dedicated team of helpers, thank you for helping my family with the food preparations and decorations. I have studied very hard to learn my Torah portion and my Haftorah. As a matter of fact, the last two months at sleep-away camp was not all fun and games. I studied very hard, in between hockey, basketball and swimming! I would like to thank my Bar Mitzvah tutors, Rabbi Pollock in Baltimore and Rabbi Netanel from Chicago who worked as a lifeguard. Now, about who I am. My name Yitzchak Meir comes from my grandfather, the late father of my mother, Harav Yitzchak Meir Haeitan Zt"l. He was the Chief Rabbi of Shomron, Israel. His life was an example of my Torah portion called Ekev. Moses transmitted the rules, laws and regulations of G-d to the Jewish people. My grandfather spoke seven languages fluently, and was a student of the late Rav Kook. He was among the first pioneers to build his community and helped establish families. He was well known as a peacemaker, extremely friendly, and loved by all. Not only was my grandfather talented in languages, he was a very gifted musician. One of the stories my parents told me was that my grandfather used to go every motzei Shabbat after havdalah, to sick people’s houses to and play the guitar and Harmonica lift up their spirits. This is one of the many examples of how my grandfather loved to make other people happy. Even though I never met my grandfather, because I carry his name, in his merit I hope to follow his actions and wonderful teachings. I found my Bar Mitzvah parsha very interesting and I would like to share some insights with you. Parshat Ekev is very different than all the other Parshot, because Israel is mentioned in this Parsha many times explaining why we should cherish the holy land, a divine gift from G-d. In Table Talk, my father’s book, interestingly in this week’s torah chapter, is the explanation of the importance of reciting blessings, particularly blessings after the meals, thanking G-d for the food we eat and the nourishment. For my bar mitzvah, I have used a portion of my bar mitzvah money to purchase for the synagogue, special booklets that have the Sabbath and holiday blessings and songs with the full English translation and the transliteration. I hope you will each look at this book and during my Kiddush lunch, we individually and collectively will sing songs and then say the after meal blessing. I was told that in the Jewish world - over a quarter of a million copies of this booklet were published and distributed. I hope through this new addition to our Kneseth Israel simcha kiddushes, we will all have a great resource to say out loud the beautiful traditions that our ancestors encourage us to recite. Toda Rabba, thank you all again for being part of my simcha celebrations, I look forward to sharing many more simchas with you. Shabbat shalom.